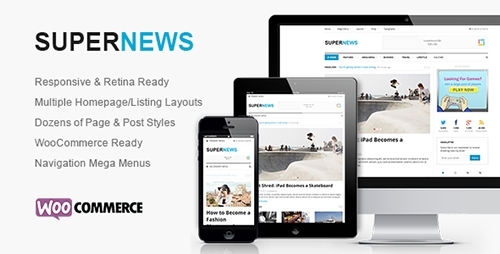 SuperNews is a fresh and powerful WordPress magazine theme (with WooCommerce support) which is beautiful and well-organized. It's perfect for news/magazine websites to attract readers visit and remember your website. SuperNews has been built by using the latest HTML5/CSS3/jQuery techniques and it's fully responsive, it works great on all devices, any screen size, including desktops, laptops, tablets and mobile phones. Present your content in a way that is accessible, logical and beautiful.